Welcome to the second season of Spread The Light. With more than 20 "Harry Potter" fansites and youtubers from all around the world united in the effort to spread the light of charities, now we are fundraising for the Anne Rowling Clinic. Founded in Jo’s late mothers’ name, it provides out care for patients with multiple sclerosis and other Neurodegenerative diseases as well as cutting edge research and clinical trials. When you donate, you will be entered to win one of our incredible prizes! 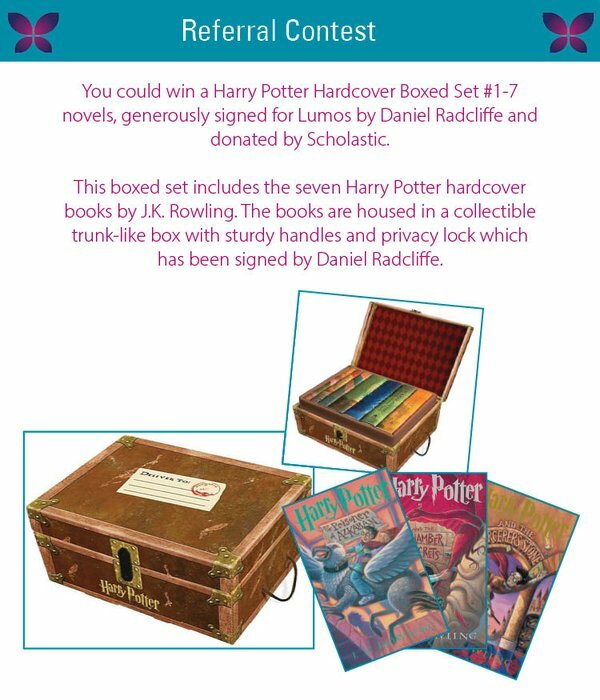 Click here to donate to the Anne Rowling Clinic and automatically enter to win fantastic prizes! Thank you for your generosity and Felix Felicis! Not a single day goes by that we do not wonder how our lives would have been if it was not for you. Your books united us across the world, and now we are letting their light shine bright. We just wanted to cast an Expecto Patronum to those in need, as you have been doing for us all these years. We hope we do you proud. Sincerely, Spread The Light staff. The book sculpture used in our layout was made by Malena Valcárcel. She lives in Alicante - Spain, next to the beautiful and warm Mediterranean Sea. She was born in Tenerife – Canary Islands where she grew up without losing sight of the sea. She has been working with paper for some years now and have specialized in Book Sculptures. For more on Malena and her work, please visit her Etsy store. Nos cadeaux ont été divisés en deux catégories : les “grands lots reliques de la mort” et les “lots vif d’or”, plus petits mais pas moins originaux. Les livres “Harry Potter Places” par Charly D. Miller en ebook, qui reprennent les lieux de tournage de la saga. Sept ensembles de sept cadeaux uniques tous liés à la saga Harry Potter ou Les Animaux Fantastiques. Chaque ensemble inclut un sac en tissu Harry Potter, un t-shirt, un marque-page, deux affiches et deux éléments surprise. Il n’y a pas deux ensembles identiques!